Wooohoooo!!! This is the 3rd Art Mesa that Cuchy and I have in Madrid on June 2013. You can find the Art Mesa Blog with all the Details here. The last two years we had a wonderful time with our students- the hotel is beautiful and we had lot’s of privacy in hour huge workshop room with the private terrace, the weather was awesome, the workshops were fun – It was just the best! 29.06.2012 – 10.00 hs. – 14.00 hs. 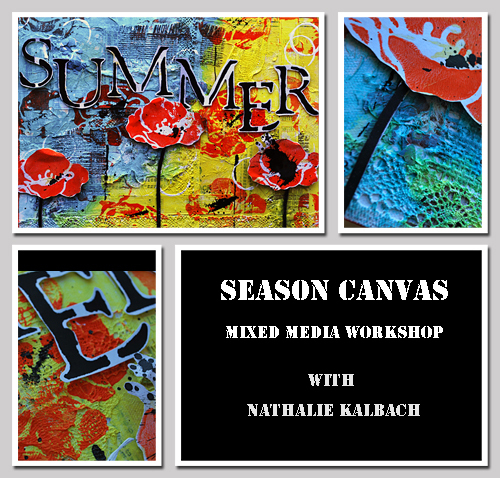 En este taller con Nathalie Kalbach, crearás un increíble y único lienzo que será un maravilloso objeto de decoración. Aprende como sacar una textura interesante y llamativa con pintura acrílica y tintas acrílicas. Añade algunas técnicas de estampación sobre todo ello. Iremos añadiendo muchas capas y dimensión para hacer un lienzo de primavera, verano, otoño o invierno… como quieras. Todas las técnicas pueden aplicarse fácilmente en futuros proyectos. 29.06.2012 – 16,00 hs. – 20,00 hs. En este taller con Cuchy, crearemos un diario desde cero, con una base de encuadernación japonesa. Un proyecto delicado al que “contar” nuestros pensamientos más secretos. 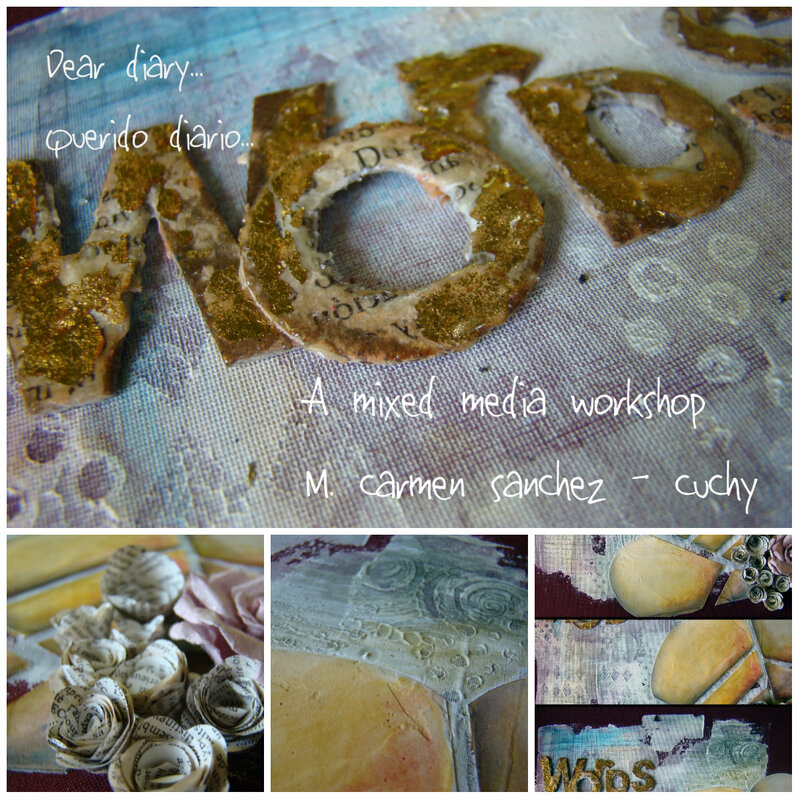 Personalizaremos nuestro diario creando distintas texturas con gesso, pasta y sellos. Añadiremos color con barras de tinta y profundidad con grafito, para acabar decorándolo con papel, foil y utee. Una mezcla de técnicas y elementos que estimularán nuestra creatividad. In this workshop with Cuchy, you will create a personal diary from scratch, using a japanese bookbinding technique. You will customize your diary creating textures with gesso, paste and stamps, adding colours with ink blocks and depth with graphite, and embellishing with paper, foil and utee. A mixture of techniques and elements which will encourage your creativity. I’ll be there again, I can not miss it!!!! I really need to win the lottery so that I can spend my time flying from country to country attending your workshops Nat. THese look like wonderful workshops!